I received this pen as gift and while it was a lovely gesture, I didn’t like the pen. Touching a perfectly polished piece of sterling silver was unpleasant for me. I tried using it but found that I was spending more time polishing it with the robin’s egg blue Tiffany sleeve than actually writing with it. Recently, upon cleaning out some drawers I found the pen again and started using it. This time I told myself I wouldn’t endlessly try to polish the pen I would just use it. The pen is a very simple straight sterling silver cylinder with a clip that has been engraved “T & CO”, “925” (92.5% silver), “1837” (Tiffany’s founding year). Around the bottom of the cap reads “Tiffany & Co. 925” and “Germany”. The pen weighs 27.4 grams and measures 14cm long and 1cm wide. This is a pretty thin pen but I have found it comfortable enough to write with for a longer period of time. I believe that this pen is manufactured for Tiffany & Co. by Waldmann of Germany. The grip section is a seamless resin with a stainless steel (?) point that does not match the sterling silver on the cap and barrel. It is quite noticeable to me that these two silver colored metals do not match. 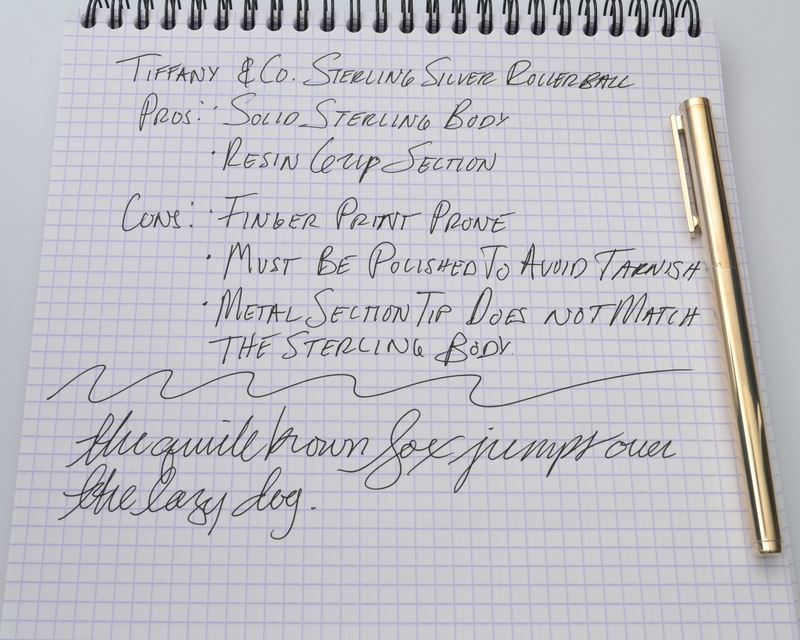 The Tiffany branded Schmidt rollerball refill writes well but it’s nothing noteworthy. I am going to see if I can find a fineliner refill for this pen. The more I use the pen the more I like sterling silver as a pen material. Sterling silver evolves sort of like a urushi lacquer and I like that. From what I can tell these pens cost about $200 which isn’t a terrible price for solid sterling silver though this isn’t something I would buy for myself but I like it nonetheless. I think I see a sterling silver Yard-O-Led fountain pen in my future. Next Post Romillo Essential No 9 Fountain Pen First Look!